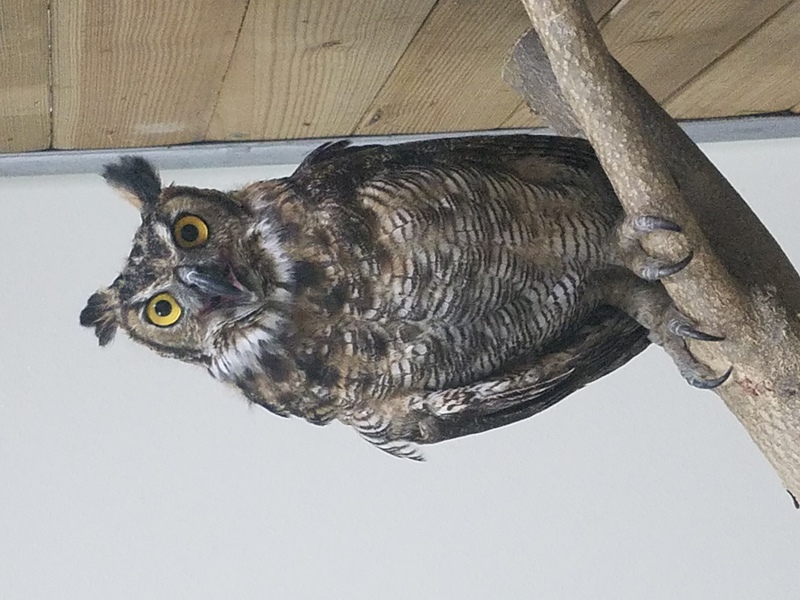 Minnie Pearl is a Great Horned Owl who was found injured as a young owlet in the fall of 2017. Minnie Pearl was found down near a road in Audrain County, Missouri. It was found that Minnie Pearl had a right elbow luxation. 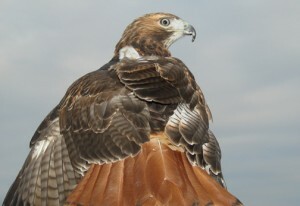 Due to this luxation, the wing was unable to heal correctly and Minnie Pearl is unable to fly. Being otherwise healthy and maintaining a good temperament, Minnie Pearl is now an educational ambassador and a permanent resident. 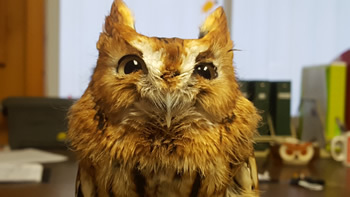 Baylor is an Eastern Screech Owl who was brought to the RRP in the winter of 2015 after being found caught in a barbed wire fence. 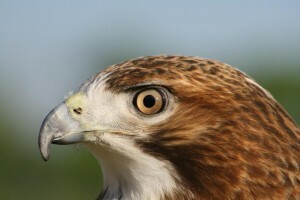 Due to the damage to his eye caused by the fence, Baylor does not have enough vision to be released back into the wild. Baylor works well around people and is comfortable since healing from his injuries. Today he is a happy, healthy education bird. Grimm was brought to the RRP in September of 2015 after being found down on the side of the road. From the damaged caused by the head on collision, Grimm does not have enough vision to be released and has since become an education bird. Hephaestus “Heph” was brought to RRP in June 2003. Heph underwent surgery to amputate the end of the left wing due to permanent nerve damage, and has since become an Education bird with RRP. 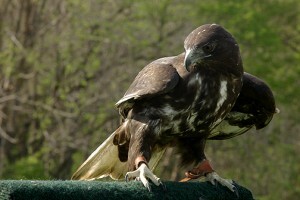 Ebeneezer “Eb” was brought to the Raptor Rehabilitation Project on December 4, 2010 after being found down a few days earlier along the median of a highway. 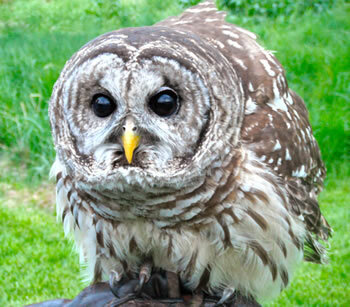 From damage caused by a possible car collision, Eb does not have enough vision to be able to survive in the wild. 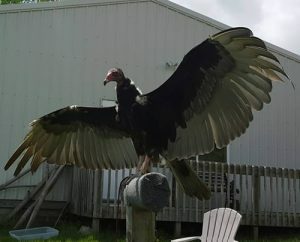 Eb was trained as an Education bird and is now a permanent resident. Brought to RRP on November 28, 2009 as an immature hawk, Jacob was discovered to have a chronic fracture in the left humerus(wing) but was other wise healthy. 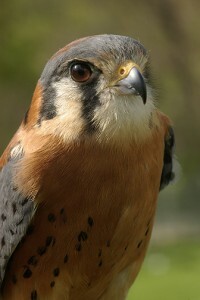 Jacob took to training very well, is comfortable around people, and is now an Education bird. Emma was brought to the Raptor Rehabilitation Project as an immature hawk on November 26, 2005. RRP found chronic (old) fractures of the right humerus and coracoid (bones of the wing and shoulder) which had healed out of alignment, making Emma non-releasable. Emma is comfortable around people and responds well to food motivation, and so was kept as an Education bird. On October 16, 1987, the Missouri Department of Conservation brought in the bird after having been found on the side of the road one week previously. Radiographs showed fractures in both wings. Because of the age of the injury, much of the damage could not be repaired, and the left wing never healed properly enough to permit flying. 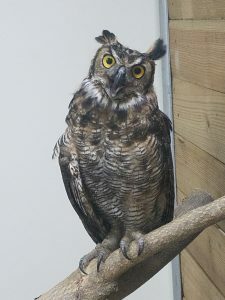 JD is currently one of the oldest residents in the Project.